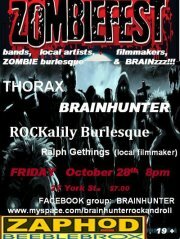 Just a reminder that this Friday, Oct 28th at the one and only Zaphod Beeblebrox is ZOMBIEFEST. A whole evening of everything Zombie, including the bands BrainHunter (the brains, no pun intended, behind this madness), and Thorax, PLUS, the Zombie Burlesque - yup, Zombie Strippers! 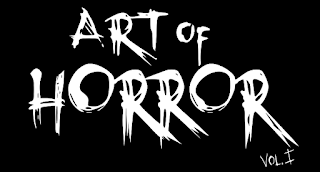 We also have films from the ever creative Ralph Gethings featuring, what else, Zombies, and a wide range of artists and artisans selling all things Zombie. Oh... and yours truly and the ZombieKing will be MC'ing the whole event. Doors open at 8:00pm, and it's going to be a big one, so don't be late!